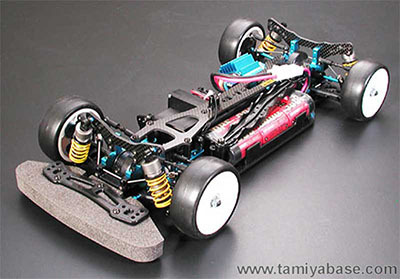 The shaft driven 4WD TB Evolution racing chassis just keeps improving, setting new standards in the R/C world. Based on data taken from real race performances by Tamiya's championship winning factory team, Tamiya Racing Factory (TRF), vital parts have been redesigned to bring you the ultimate high performance racing chassis. The main concept behind the TB Evolution IV was to improve drive train efficiency and reduce weight around the suspension, fully capitalizing on the improved drive train. The result is a fine-tuned high-performance chassis that is the ultimate weapon for any expert driver.